The Melissa & Doug Alphabet Nesting & Stacking Blocks set is a fun tower building set for young children. 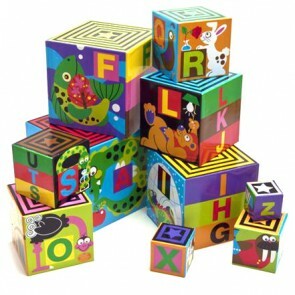 Containing 10 durable cardboard blocks that nest for easy storage, these colourful stacking blocks are designed with letters and educational pictures to assist alphabet recognition while being fun and assisting fine motor skill development. Melissa & Doug produce children's toys that are renowned for their quality and educational value. Join in and write your own page! It's easy to do. How? Simply click here to return to Language Disorder Commentary.